6 June 2013 update: “Professional Mentoring – Fostering Triangular Partnership” is now available for free download. According to Webster, diaspora means “people settled far from their ancestral homelands”. People to People (P2P) is a MentorCloud customer, a non-governmental, non-profit organization dedicated to improving health care and reducing the spread of diseases, particularly in Ethiopia and in diaspora communities. In August 2012, at the International diaspora Engagement Alliance (IdEA) annual meeting, then-Secretary of State Hillary Rodham Clinton described MentorCloud as “a new mentoring and networking web platform specifically for diaspora members trying to get involved and give back.” (Read more about this in “The Power of Diaspora Mentoring” by MentorCloud founder, Dr. Ravishankar Gundlapalli.) MentorCloud is proud and privileged to be a strategic partner for the IdEA initiative, working with organizations such as P2P. IdEA is a non-partisan, non-profit organization that engages global diaspora communities, the private sector, civil society, and public institutions in collaborative efforts to support economic and social development. How does professional mentoring interact with this Triangular Partnership, and with the global diaspora in particular? 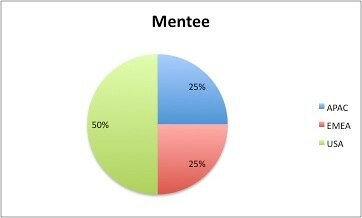 Below are two pie charts showing a summary of 2001-2009 data on mentor and mentee work locations (from p.77 of the Sun Microsystems Labs Technical Report: “Sun Mentoring: 1996-2009″ by Katy Dickinson, Tanya Jankot and Helen Gracon). As you can see, for this Sun Microsystems world-wide Engineering mentoring program, the largest number of both mentors and mentees were based in the USA (green), compared to those based in APAC (Asia-Pacific Region, blue) and EMEA (Europe-Middle East-Africa Region, red). 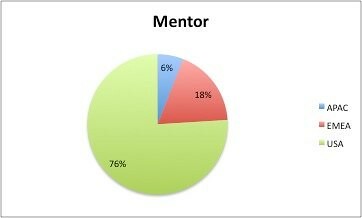 Even so, there was a disproportionate number mentors based in the USA (more than in APAC and EMEA combined). In 2009, when this data was analyzed, Sun had about 15,000 Engineering staff distributed among thirty locations around the world, including large campuses in China, India and Europe – but most of Sun’s Engineering staff was in the USA. These charts show professional mentors’ willingness to engage in successful mentoring relationships beyond borders in order to build and strengthen a community. A second example of mentors’ and western institutions’ willingness to reach beyond their national boundaries for a greater good is the TechWomen mentoring program, an initiative of the U.S. Department of State’s Bureau of Educational and Cultural Affairs (ECA). 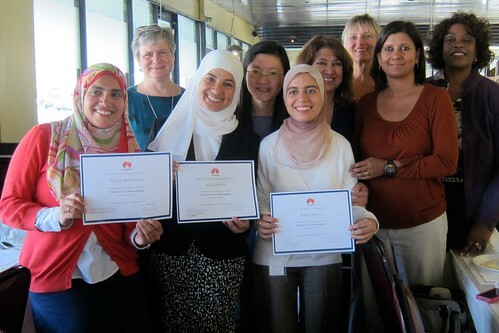 For TechWomen 2011, there were thirty-seven mentees from six Middle Eastern and North African (MENA) countries. For TechWomen 2012, there were forty-two mentees from eight MENA countries. All mentees were hosted at Silicon Valley companies for a month while working with both Professional and Cultural mentor volunteers from over fifty companies and organizations in the San Francisco Bay Area. TechWomen has been so successful that its size was doubled for 2013 and the geographic area expanded to include Sub-Saharan Africa, in addition to MENA. The purpose of TechWomen is to bring people together for greater understanding and to empower women and girls worldwide. In both TechWomen and the Sun Microsystems mentoring programs, many of the US-based mentors were either immigrants themselves or the children of immigrants. Sometimes those immigrant mentors or their families were from the same country as their mentee (a direct-diaspora connection), but most times not. 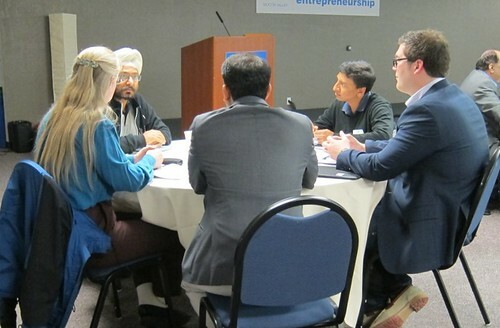 A final mentoring program example showing a more-direct diaspora connection was the sold-out December 2012 Inaugural Open Mentoring Session, presented by TiE Silicon Valley as part of their TiE SV MentorConnect program with MentorCloud. About TiE: “TiE, a not-for-profit global network of entrepreneurs and professionals, was founded in 1992 in Silicon Valley, California, USA. Although its birth name, The Indus Entrepreneurs, signifies the ethnic South Asian or Indus roots of the founders, TiE stands for Talent, Ideas and Enterprise. It is an open and inclusive organization that has rapidly grown to more than 57 chapters in 14 countries.” Feedback on the Open Mentoring Session: 82% of mentees completed the post-event survey and rated the event as “Highly Recommended” or “Recommended”. 90% of them said the event “exceeded” their expectations, and a whopping 95% said they would recommend a similar session to their friends.